3D product animation adds diversity to the content, increasing this way customer engagement. It’s a traditional view of animation and other types of video content. It’s true, but with the advance of technologies, many more ways have appeared in which 3D modeling and animation can help a marketer achieve his goals. Furniture marketing can be stressful and unpredictable. Sometimes, despite all efforts, the audience pays little attention to the content and ads. Thus, the marketers need to use all of their creativity to attract more web surfers and guide them to the product. So, visitors come and read, and get on product pages – and move on to another website. To compensate the lack of response, marketers have to expand the outreach. And even then it may happen that the effort put into materials doesn’t meet the expectations. So, to sustain the sales growth, marketers need to consume a growing portion of the company’s budgets. Thus, a furniture marketer needs to make sure that the audience gets the message, understands and responds to it. Learn how you can use product animation for promoting your furniture design. The web traffic consists of videos by about 80%. While Google remains the leading search provider, YouTube video search holds the second place. The latter is known as the world’s biggest video hosting, but the Facebook follows it closely, according to a research by HubSpot. Already in 2016, Nicola Mendelsohn, a Facebook executive, suggested that the social network “will be probably all video” in five years. Web surfers prefer video content because it catches their attention and they need little effort to watch it. Even more, they memorize videos more than twice better than texts: by 43% and 18% correspondingly, according to HubSpot. On top of this, supporters of various brands want to see videos more than any other type of content, as the research by HubSpot has shown. This way, video makes the present and the nearest future of the Internet. So, animation production companies help a business meet the demand for video content. Some may ask: what is 3D animation? In fact, it relates to still renders as video footage to photography, and both result in a video file. The difference is that 3D animation doesn’t need real objects, using instead product modeling. A professional 3D modeler knows how to create photorealistic 3D animations that will capture the attention of the audience – who doesn’t even realise it’s 3D. Of course, that’s not all about 3D animation, and only imagination is the limit to what happens on screen. By meeting the demand for videos, 3D product animation draws prospects to the website (the top of the sales funnel). Let’s imagine that one of them needs a TV console (the middle of the funnel). So, he or she goes to your website, clicks on the image and sees the most inspiring video ever. Here it is, a console that perfectly suits the TV, and it’ll fit nicely the new living room design. By the way, those chairs are totally worth looking into. So classy! This way, 3D product animation brings a purchase and a cross-sell. Finally, the prospect gets on the product page (the bottom of the funnel). An interested buyer will read the description and flip through all product images, but he will even more happily watch a video. Otherwise, customers don’t hear a human voice answering their questions unless they make a call and don’t engage with the product until it arrives. Adding 3D product animations to product pages makes online shopping a life-like experience, which results in higher sales. Social Media Advertising. Video is the most popular type of content on Facebook: it tends to get more views, likes, and shares. So, why not meet the demand and post what receives most attention? And it’s totally worthwhile to tap into the power of YouTube. A professional channel with 3D product animations for your products will educate customers on your product design while entertaining them. Google Advertising. 3D product animation is a great material for video advertising on YouTube. And this is the channel where modern people spend loads of time! Almost 5 billion videos are viewed every day. Thanks to YouTube targeting options, it allows to reach out to just the customers a company needs, and gives plenty of time to show off the design and tell the message. TV Advertising. TV commercials reach people at home, when they are most likely to pay attention to an ad. So experimenting with 3D product animation on TV might turn out profitable. Trade Show Marketing. 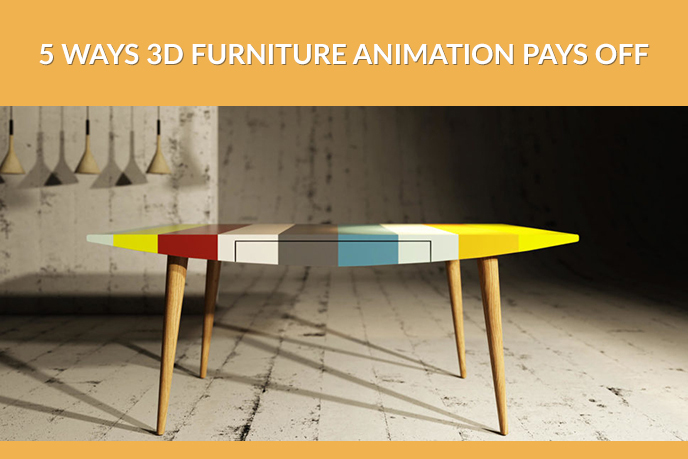 3D product animation demonstrates furniture in context, thus gaining additional value in buyers and dealers’ minds. Also, it can showcase the customization options such as secret drawers or lightening more effectively than a catalog or booklet. Outdoor Advertising. Appearing in public places, these promo videos are least intrusive and often even save us from boredom. So, people pay attention and trust them more, and it makes outdoor screens a good place for product animations. As follows from the above sections, animation is an effective attention catcher and message conveyor, and it suits a wide variety of marketing channels. It makes 3D product animation a powerful lead generator. As the prospects attracted already have interest to the product, they better respond to direct calls and emails. Also, they are more likely to subscribe to a newsletter, which could lead them to a purchase. As a classic means of storytelling, 3D animation makes for powerful case studies. It can also help a marketer represent the company’s history and demonstrate its approach to design and production. When it comes to an online store, an animation can showcase how the business ensures the quality of goods and services. A furniture business can post a 3D product animation showing how to assemble a shelf. Or a video how-to on how to choose a bed for a child. Customers understand that the company cares about them, so they trust the brand and listen to it. Meanwhile, it perfectly showcases the furnishings making a home a cozier place. Even if a viewer doesn’t buy immediately, he is more likely to keep track of new posts and make a purchase later. High popularity of videos and their unparalleled ability to convey value allow furniture companies benefit from 3D animations right now. And since the role of video content is increasing, an investment into product animations will go on bringing benefits over years. Want to showcase your product with high-quality videos? Contact UFO3D 3D modeling company and get 3D animations that educate, advertise, and sell.